Here you'll find a list of garden accessories and accents such as flower planters, garden trellis, and much more. 7 Free Woodworking Plans found in the "Garden Accents" Category. There's not much to this free woodworking plan, but it's a very simple project that anyone can build. Make sure that you adjust the dimensions to the pots or plants that you'll be putting in the planter. Binky's woodworking site is a great place to find all types of woodworking information. This free woodworking plan that Bink created is a perfect project for those scrap pieces of wood strewn across your shop. Give this plan a try. Who knows, you might start a little hobby business and sell them to your friends and neighbors. 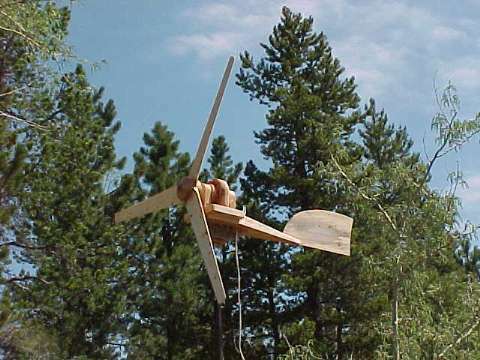 This wind generator is completely built out of wood. If you've got far too much time on your hands, you might consider trying this free woodworking plan. Beware, you'll have to make your own alternator housing from wood and then wind the alternator and install the magnets yourself. This was a very interesting woodworking project. Make sure to check out the PDF article for a full description and detailed plans. Vicki's Wood 'n Things is offering this free woodworking plan for a wheelbarrow planter. The descriptions are very good and she gives all the templates that you need to cut out the pieces. Test you woodworking skills and get rid of those empty coffee cans at the same time with this free woodworking plan from Birds and Blooms magazine. This one page article has everything you need to build this project including a color exploded diagram of all the parts. This is a great free woodworking plan. The plan has tons of detailed pages with a list of materials to purchase along with a detailed diagram of each part. Pictures of the completed project will help you assemble this free plan. If you are adventurous, you might consider upscaling the free woodworking plan into a full size wheelbarrow that you can use around the yard.